Arc in 2244-02. Photo: Kitt Peak Nat'l Observatory. When these bizarrely circular structures were first reported in the 1980s, they were described as “the largest known entities in the universe that shine in visible light.”¹ Each of two discovered² radiated as much power as 100 billion suns, and was more than 300,000 light-years long — enough to enclose the Milky Way galaxy. The center of one arc lay in a supergiant elliptical galaxy, the center of the other at the center of mass of a cluster of galaxies. How such perfectly circular structures could have been created was extremely puzzling. Within a year, two of the arcs' discoverers, Roger Lynd and Vahe Petrosian, had realized that the arcs are an illusion. The clue was that the redshift of the arc's light was much greater than that of the galaxies with which they seemed to be associated, showing that the light was coming from an object about twice as far away as the galaxies. 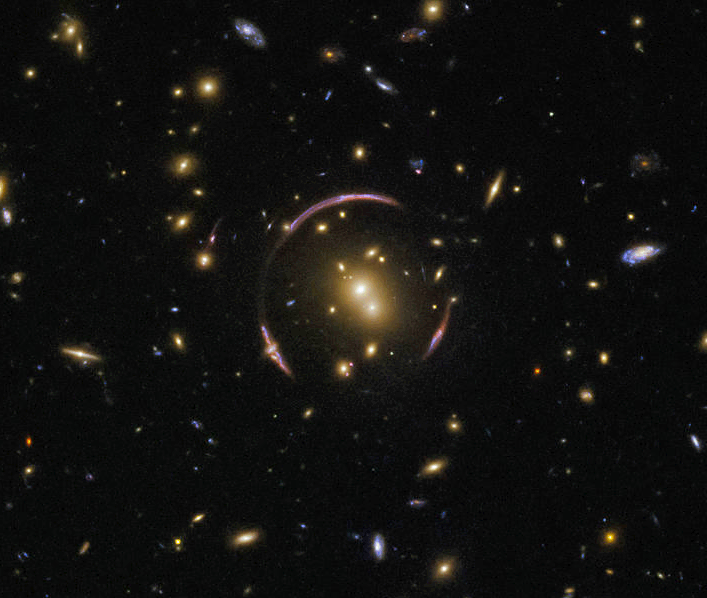 The arcs are created by the accidental alignment of our solar system, a very large mass (the cluster of galaxies in one case and the supergiant galaxy in the other), and a very distant quasar. The gravitational field of the intervening mass bends and distorts the light passing through it, like a gigantic magnifying glass. The arcs are simply artifacts of the cosmic fun house. 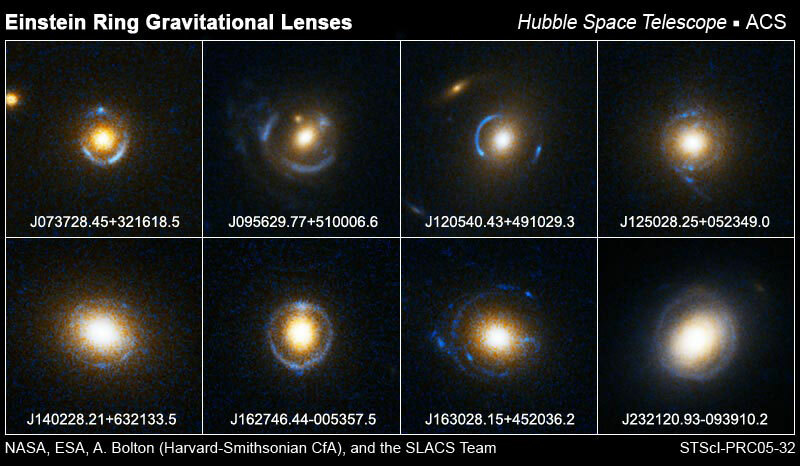 Subsequently many other examples of gravitational lenses have been found – by 2007, about 120. Most result from two galaxies lying on a line with Earth. The bull’s-eye pattern created is now called an “Einstein ring”. The light at the center of the bull’s-eye comes from the nearer galaxy; the light in the surrounding rings comes from the more distant galaxy lying directly behind the nearer one. The eight shown below were imaged between August 2004 and March 2005.
Credit: Hubble Space Telescope; Instituto de Astrofísica de Canarias. 1. Sky and Telescope, April 1987, page 379. 2. They were discovered by Roger Lynd of the Kitt Peak National Observatory, in a survey conducted with Vahe Petrosian and Allan Sandage. “The first discovery was in Abell 2218 in the Spring of 1976. Following that in the same year were the examples in 2244-02 and in Abell 370.” 2242-02 is in Aquarius (shown in the photograph), and Abell 370 in Cetus. 3. Daniela Bettoni, Renato Falomo, Riccardo Scarpa, Mattia Negrello, Alessando Omizzolo, Romano L. M. Corradi, Daniel Reverte, and Benedetta Vulcani. 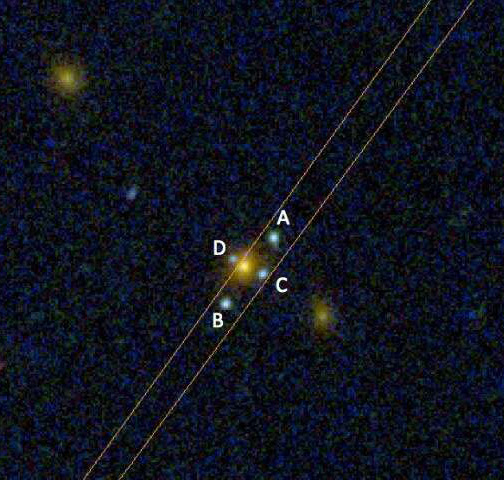 A new Einstein Cross gravitational lens of a Lyman-break galaxy. The Astrophysical Journal Letters, vol. 873, no. 2 (11 March 2019). Copyright © 2001-2019 Sizes, Inc. All rights reserved. Last revised: 25 March 2019.